The Carlisle CC+ Burner is a larger version of the CC burner. It has an added row of tubes on the outer fire resulting in a larger flame. This burner may be used with a mixture of oxygen and either natural gas, propane, or hydrogen (different tips are suggested depending on the gas used). The outer shell of the CC+ is manufactured from brass (SS optional). 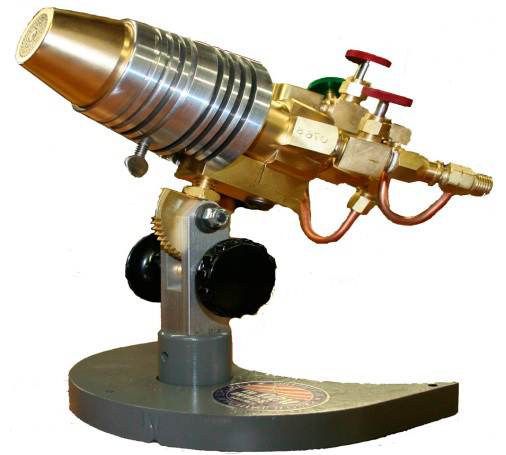 The brass shell is threaded onto a machined brass body. For fuel gas supply, four metering valves are attached to the back of the mixer body. These valves are color coded for ease of use. The oxygen valves have green handles while the gas valves have red handles. On a standard CC+ these valves are interconnected by crossover attachments to limit the feed hose requirements to two. The CC+ is also available with four separate inlets to allow for the use of foot controllers. The standard hose connections on the CC+ are welding hose "B fittings". Other connection types are available such as hose barbs and JIC connections. These connection types are explained further here. There are several styles of bases available for the CC+. The standard style is a Ball and Post mount. The Ball and Post base utilizes a crescent shaped solid steel base with a ball and socket connection. The post that extends upward is threaded directly into the bottom of the CC+ body. This style offers a selective articulation. In order to adjust the angle of the head, the user releases a thumb screw at the base of the post. When re-tightened, this provides positive burner positioning. The Rack and Pinion style mount utilizes a pinion gear to pivot the burner in an arc, offering greater range of positioning than the Ball and Post mount. The user can adjust a knob on the side of the mounting device for quick, accurate positioning. Custom lathe mounts are also available as an option. The Heat Shield is standard with any CC+ series burner. Manufactured from perforated stainless steel, the Heat Shield protects the user from the heat of the burner body. Some applications with high radiant heat transfer, will find our water cooling option desirable.